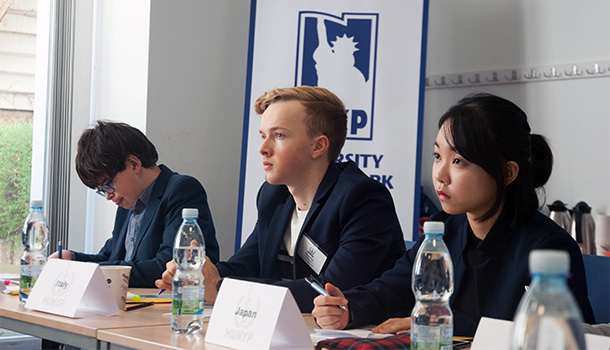 This month the University of New York in Prague is proud to host the third International High School Model UN conference, organized by the MUNYP student club. MUNYP emerged nine years ago as a platform for students who are passionate about international relations so that they can debate current global issues. Over the years, MUNYP's members have shown interest in participating in domestic or international model UN conferences, and this year, with the support of the University of New York in Prague, MUNYP will be able to hold a three-day meeting with over seventy delegates from Australia, the Czech Republic, Germany, Morocco, Poland, Russia, Slovakia, and the United Kingdom. Participation in the Model UN conference at UNYP allows students to raise their voice on global issues. We asked MUN conference coordinator, ex-president of the MUNYP club and UNYP alumna Danai Baouraki to share her experience of organizing the conference. How did you get involved with MUNYP? Back in 2012, I entered the University of New York in Prague as a communication and psychology student. I've never been closely connected to politics, which may come as a surprise as the Model United Nations society is all about political discourse & debate. In 2013, I joined MUNYP on the recommendation of a fellow student, who suggested that it would improve my research and debating skills. It turned out to be helpful and also very fun. I decided to stay at MUNYP after attending an International MUN conference in London (LIMUN). It was a fascinating and highly educational experience; as a part of a committee, I had to be very engaged and conduct proper research on the topic and the country I was representing. Moreover, while interacting with other delegates (students) who attended the conference, I realized that I was quite closed-minded when it came to international relations and politics. After that conference, I started to take MUNYP a lot more seriously, speaking up during our monthly sessions, and looking forward to it overall. At some point, my friend Allarik and I took over the MUNYP club and led it until the day we graduated. Our club was developing quickly, with many students taking part in the international conferences and winning awards. It was terrific. A year after graduation I came back to UNYP to help with organizing the international high school MUN conference, and this year I will be coordinating it for the second time. What kind of knowledge have you built up with the help of MUNYP? MUNYP helped me to become more open-minded when it comes to politics and international relations. It also helped me to improve my research skills, because to build a strong argument you need to go a lot deeper than the first three links on Google. Finally, it helped me to structure my speeches and become a lot more confident in presenting my ideas to a crowd, which became very useful for my school presentations. Why would you recommend young scholars to participate in MUNYP activities and become a MUNYP delegate? Is there any age or school requirement for participants? You are welcome to join, as long as you are a student and have an interest in politics. Overall, I would recommend young scholars to participate in MUN activities, whether as an organizer for international high school conferences or a MUNYP delegate. This society can help you to gain knowledge on various relevant topics, become more confident, improve your research, organizational and negotiation skills, and, of course, meet new people. What are some significant differences of this year's conference compared to previous years? I am proud to say that the number of delegates has doubled from last year, which is utterly fantastic. We have delegates coming from various countries such as Morocco, the UK, Poland, Russia, and many more. We believe that the debates will be very productive and expect an engaging and fun event.